Sim Samong David with his mother Sie Samol at Spantomnab Community preschool. Sim Samong David is 4-years-old and has been attending Spantomnab Community Preschool in Bou commune, Battambang province, since it opened in October 2012. David’s mother, 39-year-old Sie Samol, who grows mushrooms for a living, is ecstatic that the building which used to be a ‘Sala Chor Teann’ (a venue for meetings in the community) is now the place where children can learn and develop. 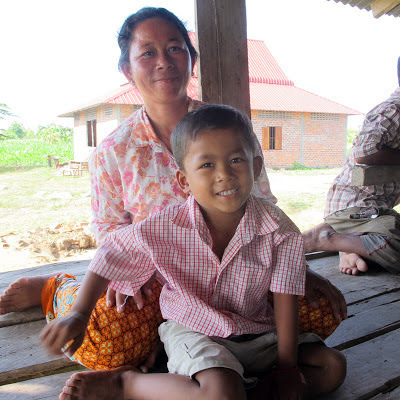 9-year-old Sam Kim Visal from Stung Treng province aspires to be a doctor when he grows up. Sam Kim Visal with his father Sam Sout in Stung Treng province. “My name is Sam Kim Visal. I am 9 years old. I go to Anuwat Primary School. I study in Grade 3. I live with mother and father and brother. My brother’s name is Sith and he’s 5 years old. I look after him too. This is Reachea Nukol village. I have lived here all my life and I’m happy. I like to visit my neighbour, my best friend Po Leu. He’s 8 years old but he goes to a different school. Srey Phea is 11-years-old and from the Tum Puon ethnic minority group. After school she works at the Boeng Yeak Lorm Lake, a tourist attraction in Ratanakiri province. Srey Phea arranging the lifejackets at Boeng Yeak Loam Lake, Ratanakiri province. “My name is Srey Phea. I’m 11 years old. I live in Phum Lun village, which is about thirty minutes’ walk from here [Boeng Yeak Loam Lake]. My house is very small and has a zinc roof. There is only one room. I live with my older sister Dorb who is about 30 years old and my cousin Pom who is 20 years old. We are from Tum Puon national (ethnic minority group). My parents don’t live with me. They live in La Kat village. If I walk [to my parents’ home] it takes one hour to get there. If I go by motorbike, it takes me thirty minutes to get there. My parents are farmers and they plant rice and other vegetables. At a UNICEF-supported community preschool in Svay Rieng province, southeast Cambodia, the teacher leads children aged 3 - 5 as they act out the words of a song. May 2013.